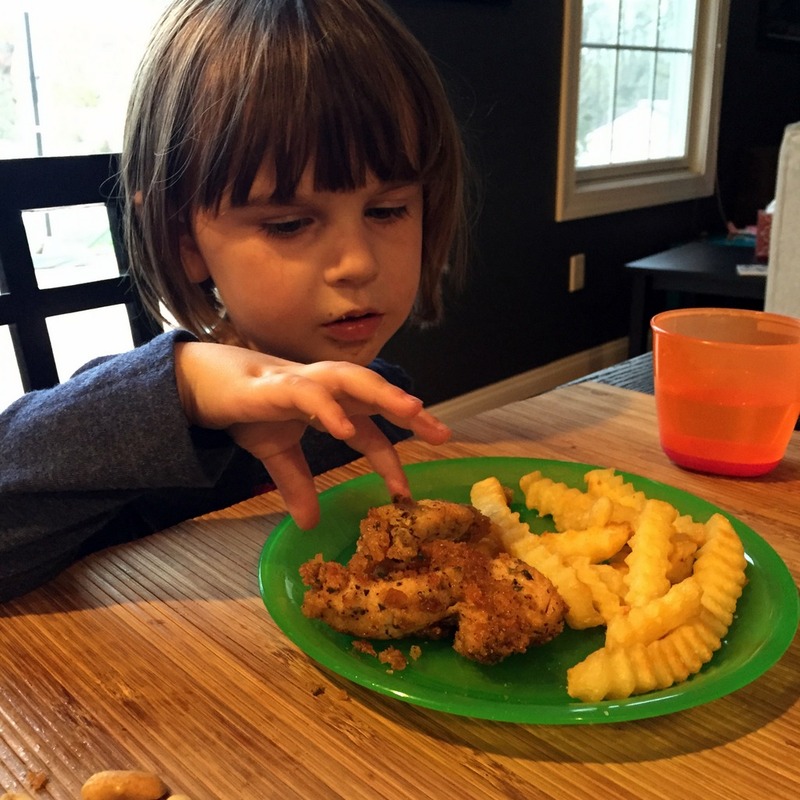 I think other people’s kids might love these, but my child…is my child. Food is a hugely contentious issue. Actually, she’s gotten better this year, but she still has a very limited number of things she’ll eat. I made these way back in April but never posted, and maybe I should try them again. She picked at them but refused eat them. I bet I could get her to try them now. She is very susceptible to bribery. We went through this power struggle phase all through the first half of the year where she refused to eat absolutely anything that I cooked. Period. Unless it was chocolate, or she saw me take it out of a packet and heat it up, she wouldn’t touch it. She’d eat some things Nana made, and things that Daddy made. But if Mommy made pancakes? Well, they were clearly poisoned. This was a great experience for someone who loves to cook. Like, a lot. And all the time. I didn’t have much cooking mojo left after that. It’s hard to cook something from scratch for someone who just throws it on the floor. Anyway, this is a Geoffrey Zakarian recipe from his book My Perfect Pantry, which is an excellent book. And they were yummy, I promise. Preheat the oven to 250°F. Season the chicken strips with salt and pepper. In a large, shallow pan, beat the eggs with the oil. 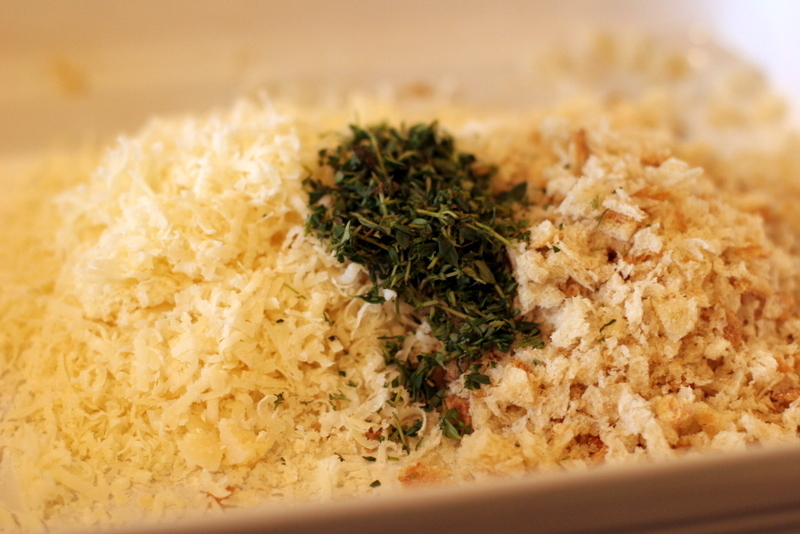 In another shallow pan, combine the bread crumbs, cheese and thyme. 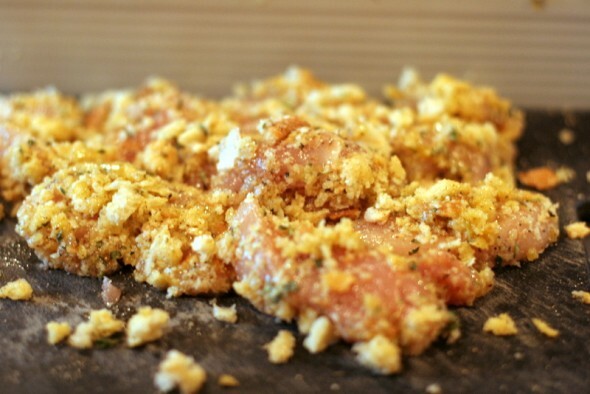 In two or three batches, dredge the chicken in the eggs, then in the bread crumbs. 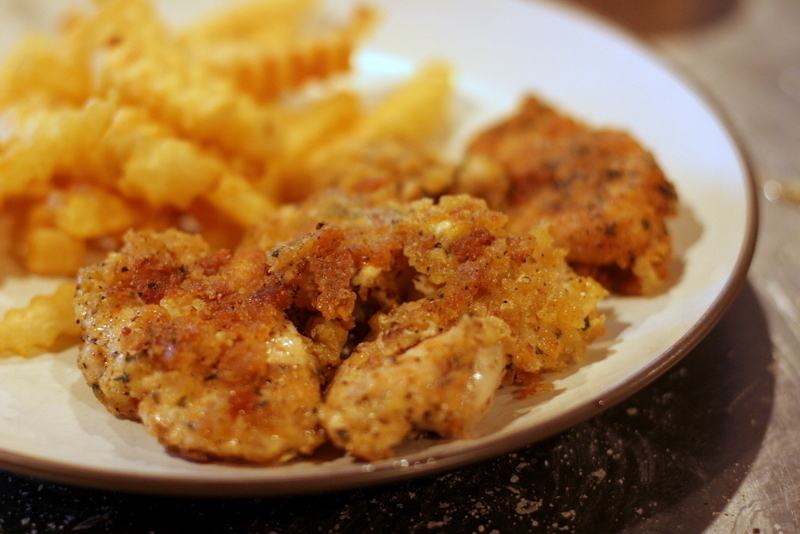 For extra-crispy chicken fingers, dredge one more time in the eggs and bread crumbs. 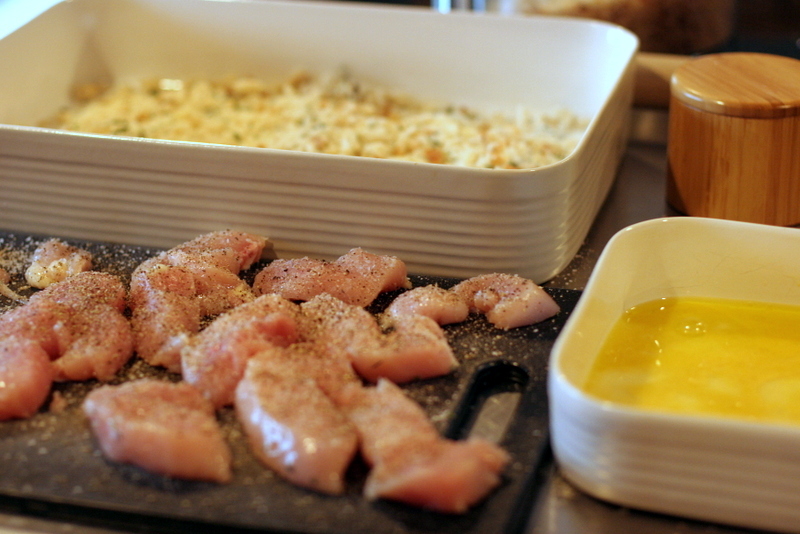 Then put the chicken on a parchment-lined rimmed sheet pan while you dredge the remaining batches. (Next time I would definitely coat mine even more). In a large, preferably nonstick skillet, heat about 1/2 inch oil over medium heat. Melt the butter in the oil. Once the oil is hot enough that a touch of the bread mixture bubbles when sprinkled on top, add a batch of chicken fingers. Fry until crispy and golden brown on both sides and cooked through, about 3 minutes per side.Drain on a paper-towel-lined rimmed sheet pan. Keep the chicken fingers warm in the preheated oven while you fry the remaining batches. Serve immediately, with creamy blue cheese dressing or ketchup on the side.